Little is known about the inner structure of the Moon, but a major step forward was made by a University of Rhode Island scientist who conducted experiments that enabled her to determine the temperature at the boundary of the Moon's core and mantle. 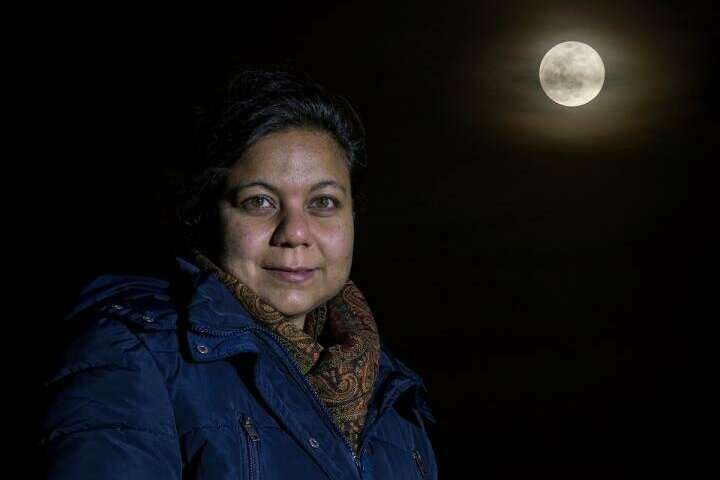 "In order to understand the interior structure of the Moon today, we needed to nail down the thermal state better," said Ananya Mallik, a URI assistant professor of geosciences who joined the University faculty in December 2018. "Now we have the two anchor points—the core-mantle boundary and the surface temperature measured by Apollo—and that will help us create a temperature profile through the Moon. We need that temperature profile to determine the internal state, structure and composition of the Moon." "The big question is, why would we have some melt present in the Moon at that depth," Mallik said. To begin to answer this question, Mallik conducted a series of experiments in 2016 at the Bavarian Research Institute of Experimental Geochemistry and Geophysics in Germany using a multi-anvil device that can exert the high pressures found deep inside the Moon. She prepared a tiny sample of material similar to that found on the Moon, squeezed it in the device at 45,000 times the Earth's atmospheric pressure, which is the pressure believed to exist at the Moon's core-mantle boundary, and used a graphite heater to raise the temperature of the sample until it partially melted. "The goal was to determine what temperature range would produce a 5 to 30 percent melt, which would tell us the temperature range of the core-mantle boundary," she said. "It's important that we know the composition of the Moon to better understand why it has evolved as it has," Mallik said. "The histories of the Earth and Moon have been intertwined since the beginning. In fact, both are the product of a great collision between proto-Earth and an approximately Mars-sized body that occurred over 4.5 billion years ago. So to understand our Earth better, we have to know our nearest neighbor because we all had a common start. "Earth is complicated," she continued. "Any similarity in the composition between Earth and the Moon can give us insight into how these two planetary bodies were formed, what were the energetics of the collision, and how elements were partitioned between them." The URI geoscientist noted that Earth has evolved through the process of plate tectonics, which is responsible for the distribution of the continents, the topography of Earth's surface, the regulation of long-term climate, and perhaps even the origin of life. But there is no evidence of plate tectonics on the Moon. "Everything on Earth happens because of plate tectonics," she said. "What does this tell us about our own planet when the Moon doesn't experience this process? It's the same argument for why we study Mars and Venus. They are our next closest neighbors, and we all had a common start, but why are they so different from our planet?" The next steps in Mallik's research will involve experimentally determining the density of the molten material at the core-mantle boundary, which will further refine the temperature range. In collaboration with Heidi Fuqua Haviland at NASA's Marshall Space Flight Center and Paul Bremner at the University of Florida, she will then combine these results with computational methods to derive the temperature profile and composition of the interior of the Moon. Mallik's research was published April 1 in the journal Geochimica et Cosmochimica. Here is an issue that O have not seen addresses. Ig any one has a legitimatem Real Science link to my qiestion? Please post it in comments. These questions I first came up with during recent artivles about Mars. I believeare also relevant to Lina. My understanding of these subjects: Mass & Weight are not the same thing. A decimeter cubed of rock, that weighs one Kg on Earth, Would weigh !/3 Kg on Mars. & 1/6 Kg on Luna. Without changing it's Mass or Dimensions of Measurement. & of course, that remains true even in micro to zero Gravity. Question: Why assume the properties of the rock material will be the same across the three worlds? Even if they consist of the same elements? Perhaps. deep in the three planets, there may be either similarities or maybe equivalents? Considering all the possibilities of random chances with primeval materials getting mixed in different proportions? Then closer to the surface of all three planets, there is an important difference. The Earth's Atmosphere, Hydrosphere & Biosphere. A trifecta of mineralogical effects. That, at best, may have temporarily existed for a short time in the earliest histories of Mars & Luna.. Even for Mars, that first billion years has been superseded by the billions of years since of excruciatingly protracted deterioration & erosion. Another question: How deep would explores have to drill to reach liquid water? If deep & saturated into bedrock? How much gear will explores need to bring to reach it? To Crack it to separate from minerals? To process it for industrial use? To process that for potable use? Cause, any volatile, liquid or ice, anywhere near the surface of Luna or Mars? Is going to have been sublimated by the vacuum at surface level. Sucked out & lost to Space. From that slow activity comes the temporary surface pockets of ice. "plate tectonics, which is responsible for the distribution of the continents, the topography of Earth's surface, the regulation of long-term climate, and perhaps even the origin of life." There are models that show plate tectonics are not necessary to regulate climate as much as having an ocean, ocean crust erosion suffice. I vaguely remember reading an article a few years ago. That researchers claimed somewhere between two to three thousand varities of minerals. That were unique & probably only to be found on our Earth. For all those reasons you listed & torbjorn & my list. Defining minerals as amalgamates of elements by continuous but often random environmental, biological, geological operations. Over endless cycles of chemical processing. Thousands, maybe millions of events? Over billions of years.